Eurostat (2012). Media use in the European Union. Report November 2012. Available via http://ec.europa.eu/public_opinion/archives/eb/eb78/eb78_media_en.pdf. Accessed 29 Aug 2013. Košak, K., & Žumer, J. (2012). Njihova govorica. Mladina. Available via Mladina. http://www.mladina.si/115464/. Accessed 25 May 2013. Mekina, B. (2011). Lažna alternativa. Mladina. Available via Mladina. http://www.mladina.si/54328/lazna-alternativa/. Accessed 25 May 2013. SORS. (2012). Usage of information-communication technologies in households and by individuals, Slovenia, 2012—final data, Statistical Office of the Republic of Slovenia. http://www.stat.si/eng/novica_prikazi.aspx?id=5037 Accessed 30 Aug 2013. Štefančič, M. (2011). Revolucija! Mladina. Available via Mladina. http://www.mladina.si/53094/revolucija/. Accessed 25 May 2013. Tomažič, A. (2013). Moč družbenih omrežij. Available via Pogledi. http://www.pogledi.si/druzba/moc-druzbenih-omrezij. Accessed 29 May 2013. UK Office for National Statistics. (2013). Social networking: The UK as a leader in Europe, UK, New South Wales. http://www.ons.gov.uk/ons/rel/rdit2/internet-access---households-and-individuals/social-networking--the-uk-as-a-leader-in-europe/sty-social-networking-2012.html. Accessed 30 Aug 2013. Vehovar, V., Jerman Kuželički, A., & Lebar, L. (2011). Socialna omrežja 2011 (#94). 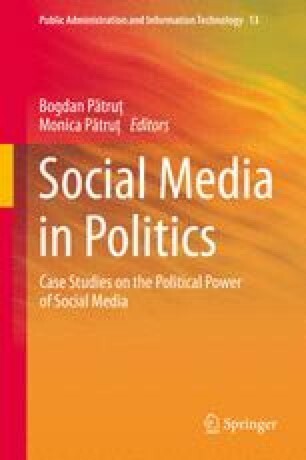 Available via http://www.ris.org/uploadi/editor/1307495011poroilo_spletneskupnosti.pdf. Accessed 29 Aug 2013.